Not many in Bangalore have heard of Asarenagar, and you will not find it on most city maps. But as far as names go, Asarenagar makes up in poignancy what it has not achieved in popularity. 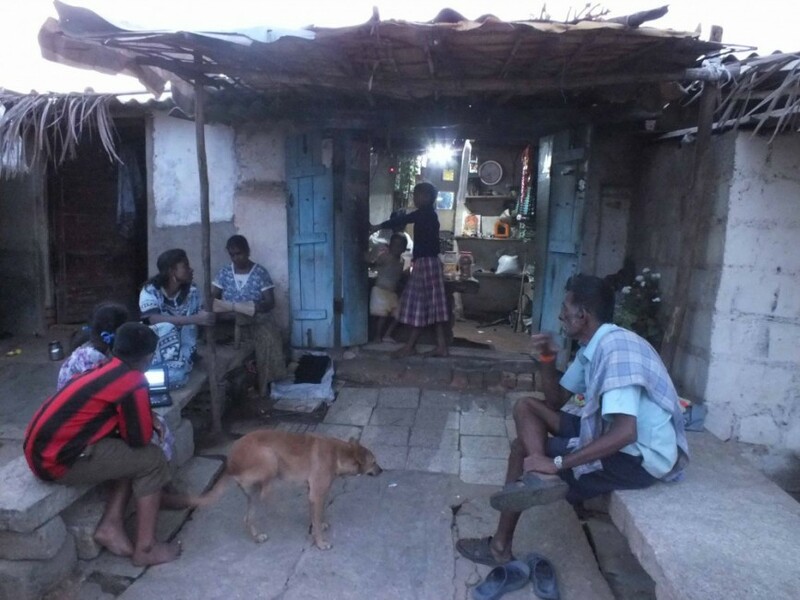 “Asare” in Kannada means shelter, and for the 1,150-odd families living in the squatter colony, the cluster of small houses built of cement bricks, stones and tin sheets; and roofed with asbestos sheets is just that—shelter from the elements. Four years ago, a fire gutted a large part of the slum, and some people fled never to return. Most of them, however, chose to come back and re-build houses with what material they could forage or find. Migrants from all parts of Karnataka as well as Tamil Nadu, Andhra Pradesh and Maharashtra, make up a significant number of the residents of Asarenagar. Most of them are employed as daily construction wagers, garment workers, loaders, drivers, waiters, and in various blue collar jobs in the factories located in the nearby industrial centre of Peenya. Over time, temporary shelters became home, their structures strengthened by ad hoc re-inforcements, irregular efforts of government agencies and NGOs to provide amenities, and the universal creativity that people besieged by necessity display. All the families in the settlement live well above Planning Commission deputy chairman Montek Singh Ahluwalia’s “poverty line”. That is, they earn above Rs.28.35 a day per member. Families in which both parents work as construction labourers earn anything between Rs. 10,000 and Rs. 12,000 a month, far above the Rs. 4,825 on which a family of five is expected to survive in cities and not add to the statistics of the “poor”. If poverty is extreme deprivation and the poverty line is the starvation line, then Asarenagar is not poor. Most families send their children to school, some even to private schools, they can afford to pay for basic healthcare, they have toilets, get five vessels of water a day from community borewells, a few own motorbikes and almost all own mobile phones. Asarenager is surrounded by tall metal towers. Thick ropes of high tension wires swing from one post to another, encircling the slum like a fence in the sky. The wires light up Bangalore—its homes, its IT parks, its pubs, its neons. Asarenagar, of course, lives in the dark. In July 2009, Selco, a private social enterprise, approached the residents of Asarenagar. It wanted them to buy solar power units. Renewable energy, while eco-friendly, requires higher initial investment than the grid-based conventional energy and its target group has generally excluded the lower socio-economic strata in both rural and urban areas. Selco is the brain child of Magasasay award winner Harish Hande, who co-founded it in 1995 as a means of providing solar power in rural areas that are under-served by conventional grid system. Along with providing solar systems for household and business use, Selco maintains the panels, and works with banks to provide financial assistance to poor customers. People of Asarenagar wanted electricity: for their children who wanted to study, for women who wanted to cook without squinting in the dark, and men who wanted to charge mobile phones. 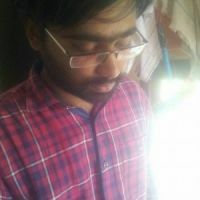 They had gone to Bangalore Electricity Supply Company for power connections. They were told that it was not possible to draw electricity from the high tension wires for household connections. And with no property deeds over the government land they have occupied, Asarenagar residents have no legal status to apply for electricity connections for their homes. Even then Selco had difficulty convincing people that solar power would be an ideal solution for them. “It was very difficult at first to persuade people that it was worthwhile investing Rs. 8,000 in a solar power system. I conducted a field study and collected data about the energy requirements of the people, their jobs, and income levels and about the money they spent on kerosene lamps. In the long-run they were spending more on their energy requirements than it would take them to buy the solar equipment,” says R Shankar, the Selco executive who carried out the project of electrifying around 65 houses in the colony. Shankar kept visiting Asarenagar every day, talking to people he met at the temple, at the local stores and the narrow, unlighted lanes were men returning home from work congregated for cigarettes and small talk. It took him 15 days to find his first customer. In the time he spent at Asarenagar, Shankar started wondering how people living there charged their mobile phones. 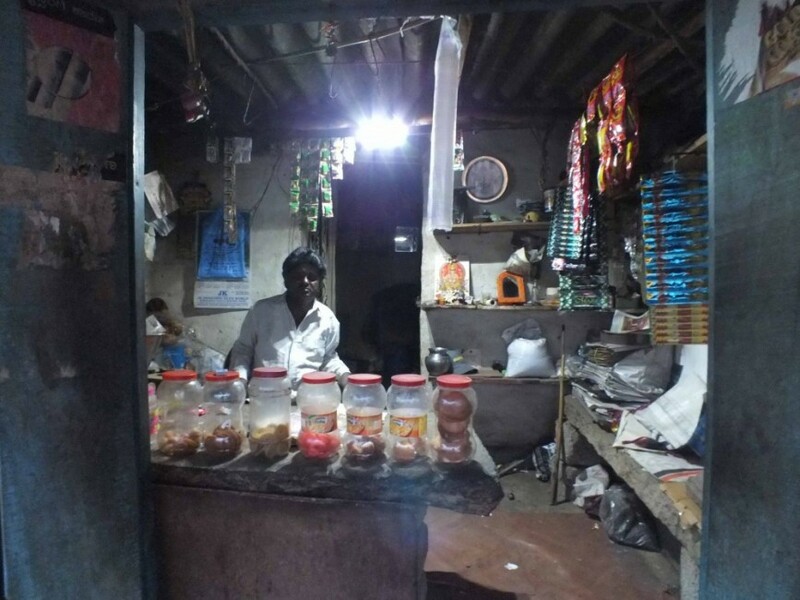 Narayan’s business has boomed after he put a solar light in his shop. The light has made the shop a hangout for people at Asarenagar. Gajendra, father of two school-going children, works as a driver. He wanted electricity at home as the light from the kerosene lamps was really too dim. His children’s eyes smarted from the soot that the lamps gave off when they huddled around the lamp’s small circle of light to study in the evening. But what was driving him nuts was the cost and inconvenience of charging his mobile phone. Outside Asarenagar, along with mobile recharges, shops also sell “charge”. It cost Gajendra Rs. 5 per recharge. He spent more than Rs. 100 a month to keep his mobile working. It was a waste of time as well as money. When Shankar approached him with the solar unit, Gajendra was hesitant. One unit, which consisted of a solar panel, a battery, a charge controller, two solar lamps and a mobile charging unit, came for Rs. 8,000. Then Shankar sold him a business idea: Go for a different type of unit with a single lamp and five mobile charging units. It would cost Rs. 9,000, but Selco would knock off Rs.500. He could sell “charge” to his neighbours and use the money to pay his installments. And in a year, he could start earning a profit. In 14 months, Gajendra paid up the amount and now owns the unit. He reckons he makes between Rs. 800 and Rs. 900 a month by charging his neighbours’ phones. And his children are very happy with the solar light. Narayana has converted one room of his two-room house into a shop. He lives in the back room and conducts business from the front room. The solar lamp has been good for him; customers hang around longer after dusk falls. The solar unit cannot run televisions, but an FM radio blaring Kannada songs relieves the monotony of the hours when there are no customers. It’s only six in the evening, which is early for Asarenagar, but some people are already sitting in front of the shop, basking in the light of the solar lamp. Children studying by the kerosene lamp at Asarenagar. On a stone slab by the shop side, children are watching a movie on a disc player, a novelty introduced after the solar units became common. Rajeshwari, who lives next to Narayana, came to Bangalore from Tamil Nadu as a child when her grandfather migrated seeking employment. She has lived without electricity for the better part of her life. She says the solar lamp has changed her life in one major way—she can have home entertainment from the portable DVD player while her husband is at work and children at school. “I used to watch movies at the theatre before. But now I can watch them at home regularly on a disc player. I either rent DVDs from neighbourhood shops or buy them,” she says. The International Energy Agency (IEA) reported last year that 28.9 crore people in India have no access to electricity. One in four Indians lives in darkness and without access to the amenities of modern civilisation that electricity enables. Of this 26.1 crore live in rural areas. According to the National Electricity Plan, a report prepared by the Central Electricity Authority and released in January, 56 per cent of India’s rural households do not have access to electricity. The power sector is facing a crisis with consumption growing rapidly with production capacity unable to keep pace. To meet the country’s energy requirements, the government estimates that we will have to generate 63,000 MW by 2032. According to IEA, India needs to invest $135 billion in the power sector in the next 30 years for universal electrification. While India has been promoting wind and solar, the bulk of its electricity requirements will be met from coal, hydro-electricity and nuclear power. In the meantime an entire generation will grow up with no or insufficient access to power, affecting their education, livelihood, and quality of life. Several thinktanks and organisations including the United Nations have urged India to invest more in renewable energy like wind, solar and biogas. Solar power is potentially promising because of consistent availability of sunlight in India and because of technological improvement driving down the cost of photo voltaic cells. While the debate about development verus sustainability rages on, organsiations like Selco continue to deliver off–the-grid decentralised solar power to rural as well as urban populations whom the government has pretty much abandoned for the time being. The IEA report says that 1.3 billion people in the world live without access to electricity. The total cost of lighting homes using kerosene is estimated at $36 billion every year, according to a report prepared by the International Finance Corporation and quoted in the Economist magazine recently. On an average, each family in Asarenagar saved Rs.100 a month on mobile recharges and Rs.150 a month on kerosene after getting solar power. In other words, each family saved Rs.3,000 a year on energy requirements and the total expenditure saving of all the 65 families come up to Rs.1.95 lakh annually. If they use conventional electricity, the monthly charges they pay the supplier would cancel out most of the savings. Without a television, Rajeshwari pays far more for watching movies alone than she would for a cable connection, but that has not deterred her from becoming an avid fan of the Kannada and Tamil film industry. Rajinakanth has always been her favourite, but she has now added Vijay and she has been getting hold of all his old films including her favourite Thirumalai, an action-romance potboiler. Rajeshwari and 60 other families bought a two-lamp solar set costing ₹8,000 through a financial package worked out by Selco with a private bank. Unlike Gajendra who paid instalments of Rs.1,000 a month, Rajeshwari, whose husband is a labourer, has to pay monthly instalments of Rs.165 including interest, over a period of four years. The capital is subsidised by almost ₹1,000 by the National Bank for Agriculture and Rural Development (NABARD) under the Central Government’s National Solar Mission, so that when she pays off her loan next year, she will not be paying more than the cost of the set. The disc player the children are watching the movie on belongs to Kadappa, a 41-year old construction labourer from Bangalore who has made Asarenagar home for the last seven years. While he is treating the motley group of children to a new Kannada movie, his own Sangeeta and Kaushalya are back home. “They get to watch movies only on Sunday. We got solar power only three months ago. They are doing better at their studies and we don’t want them to get distracted,” says Kadappa as he leads the way to his house. The main road from the busy Jalahalli flyover runs around the entrance to Asarenagar and the streetlights cast a half-light in front of the shop. The narrow paths between the houses—one elbow apart from each other—have small islands of pale red coming from the kerosene lamps inside the house, glowing like beacons in the sea of darkness that envelops the path at night. Kadappa’s house is the last one, the warm glow of the solar lamp in his house is visible from afar, and comforting, like a lone lighthouse in a stormy night. The construction is typical of the relatively more pucca houses in the area, a two-room concrete block affair with white asbestos sheets for a roof. But unlike most, Kadappa or his wife (or perhaps both) has seen to it that the house is not tacky and crowded with utensils, odd bits of furniture and broken stuff. A small square verandah has been improvised at the entrance, with two slabs of stone serving as seats. In the living room, a cot ranged along the wall doubles up as a divan, and a brick partition divides the house neatly into kitchen and living-space. Instead of the standard solar lamp, Kadappa has installed a CFL light. Hanging from the ceiling in the centre of the living room, it is powerful enough that his wife prepares tea in the kitchen while Sangeetha and Kaushalya—his children—squat underneath the light with school texts open, their backs to the partition. They are both too shy to make conversation, and Kadappa starts talking about how much impact that single lamp dangling from the ceiling is making on his children’s life. “Sangeetha is in the fifth standard and Kaushalya in the third. They have improved so much in the three months since we got the solar lamp that the headmaster was satisfied with their first terminal examination results. He told me that if they can improve so much, he has no complaints to make,” says a proud Kadappa. It is not empty talk. Sangeetha who averaged 65 per cent in her fourth standard managed to score 93 per cent in the latest exam. Kaushalya had great difficulty with learning to write English. When they had kersone lamps, the children would start studying at six in the evening but would be forced to wind up by eight, as the light grows too dim by nightfall. Now Kaushalya can practice writing her lines up to 10 p.m. or beyond and has become quite fluent at it, according to Kadappa. It is possible that Sangeetha and Kaushalya have inherited their shyness from their mother. Kadappa’s wife assents when he says that her lot has been improved after they bought the system. Pressed for details, she goes silent. Not her neighbour Lakshmi. Her husband Govindaraju and their two sons have had solar power in their house for three years now. While Govandaraju works as a dresser in a city hospital, she works in a nearby garment factory. 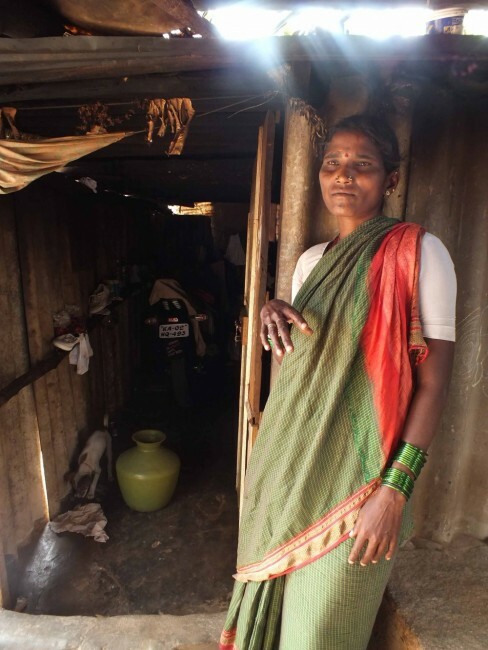 Lakshmi does not hesitate when asked what the solar lamps have done for her family. The children have benefited most (12-year-old Ravi quips that his English is better now), but there is no denying that life has become easier for her too. Mallamma and her husband her construction workers. She has enrolled her daughter in an English medium school. Her daughter has to charge the torch for `5 everyday so that she can study. One of the most attractive things about solar power is that though the initial investment is high unlike with conventional energy, there are no recurring costs. Kadappa is one of the few people who have bought solar systems from a supplier other than Selco. He says he would have preferred to buy from Selco, though the unit costs much more. The solar set he bought from a local supplier costs Rs.3,000 but comes without a warranty and the supplier does not offer any maintenance. The private bank which offered loans to the first batch of 60 people in 2009, stopped it in 2010 since many people stopped paying. The bank asked for an initial down payment of Rs.1,000, an offer several Asarenagar residents took up. But the bank changed its policy a little later and stopped the loans altogether, returning their money to the disappointed applicants. Paying the loans back has not been easy for 38-year-old Bylappa, He says he has managed to keep up the payments. He has more than a year before he can close the loan. But he has absolutely no regrets about his decision. “If the light is fully charged, we can keep it on till midnight. I have three girls and it is difficult for all of them to study using a kerosene lamp. After we bought the solar lights three years back, it has helped them in their education. I am more than happy for that,” he says. Bylappa’s oldest daughter Yellamma is in the ninth standard. A tall, chirpy girl, Yellamma is all praise for the solar light that she says has fetched her more marks. When she was in fifth standard, she had to get back from school and start her lessons as early as possible. By 8 p.m. to 8.30 p.m. light from the kerosene lamp would be too weak and her straining eyes would no longer be able to make out the words. Then she and her little sister Lakshmy would walk down the road and sit under the street lamps with their school books spread out on their knees. They would study till about 9 p.m. and return home as the streets grew deserted. “Studying on the road was not pleasant. Sewage water used to flow through the gutter running along the street lamps and it used to smell bad. Anyway, we couldn’t study for too long because we were worried about safety,” Yellamma recalls. Now she and Lakshmy begin their lessons at 7 p.m. and study for three hours. And if there is a test they can stay up till midnight before the battery powering the solar lamp drains out. Sidappa and Mallamma’s eldest daughter is also named Lakshmy. She is one of the few children in Asarengar who study at an English medium school. Seven in the evening finds her poring over her books under a torch tied to the middle of a pole so that it hangs upside down, casting a steady circle of light on the floor. The pole stands in the centre of the large single room and on a nearby shelf, a kerosene lamp sits unlighted. Sangeetha is in the fifth standard and Kaushalya in the third. They have improved so much in the three months since we got the solar lamp that the headmaster was satisfied with their first terminal examination results. He told me that if they can improve so much, he has no complaints to make. In an hour, when the torch dies, Lakshmy will light the kerosene lamp and continue her lessons. 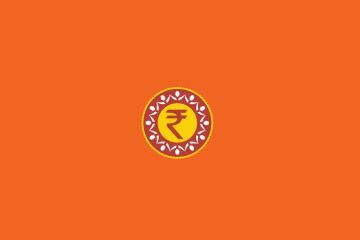 Every day, the eighth standard student gets the torch charged from a neighbour’s solar battery by paying Rs. 5. And she has arranged her school curriculum into two groups—torch light subjects and kerosene light subjects. So Kannada, science and social science go under the torch light as Lakshmy finds them difficult. English is difficult too, since she was studying in a Kannada medium school till last year, but she studies it in the light of the kerosene lamp, along with her easy subjects, maths and Hindi. Both Siddappa and Mallama are construction labourers. Last year, they enrolled Lakshmy in an English medium school run by a private education society. They have to shell out Rs.500 a month for the tuition fees. They have not been regular with the fees and Lakshmi often comes back saying that the students and teachers taunt her about it, says Mallamma. She is not sure she wants to continue next year and her parents don’t see how they can afford to pay for next years’ text books. “But if she says she wants to keep going, we will send her. We will have to make the money somehow,” Mallama says. The couple’s eldest son entered college this year and is studying B.Com. The second son dropped out of school after eighth standard and is working now as a labourer. The income he gets has been crucial in keeping his three younger sisters in school and his older brother in college. The family had approached the bank for a loan to buy solar lighting panels to help the kids study. They paid Rs. 1,000 that the bank asked for but as it happened with others, the bank returned the amount. Mallamma is still hopeful that they might get financial assistance to buy the solar unit. “The children face great problems in studying with a kerosene lamp. The smoke gets into their eyes all the time and sometimes they cry because their eyes burn. I am also worried because we have a thatched roof and it’s dangerous,” she says. In 2012, as part of its “Climate Change Action Plan”, the government of India launched a National Solar Mission (NSM) aimed at increasing the share of solar energy in India’s power sector. At present, solar power accounts for only 1 per cent of the country’s power output. Through NABARD, the solar mission offers subsidies to poor people who seek financial assistance from banks for buying off-the grid solar units. The NSM is a result of India’s participation in the United Nation’s Framework on Climate Change, which has among its main objectives the promotion of renewable and eco-friendly sources of energy to reduce the risk of global warming. Children watching a film on a potable DVD player which can be charged by the solar panel controller. The NSM has a target of generation 20,000 MW and covering 20 million households by 2022. While NSM is high on good intentions, it has been criticised for being inefficient in implementation and failing to have any real impact on solar power penetration in the country. Some organisations like Selco say that the government initiative has actually had a negative effect on the solar power sector. Prasantha Biswal, a Senior Manager at Selco says: “The government’s National Solar Mission is a case of people with good intentions creating the opposite effect. NABARD and the Ministry of New and Renewable Energy, which is the nodal ministry for the implementation of the solar mission, have absolutely no experience in the solar sector. The subsidy programme is having a negative impact on solar power penetration. “Prospective buyers apply for the subsidy but it is delayed due to red tape and many applications are rejected because of NABARD’s eligibility criteria. “If the bank resumes giving loans, I think at least 300 families would take solar power in the colony,” says Kadappa as we leave his house. While the bank says that most families who availed of the loan did not make regular monthly payments, Shankar denies that the residents were not interested in paying up. “Most of these people opened accounts for the first time in their life when bank executives came to the colony to initiate the loan process. “I used to get calls from them asking me to come and collect the monthly amount since they did not know where the bank’s branch office was located. The bank has not put in place a successful business correspondent model and not followed up regularly. If they did, everyone would pay,” he says. Shankar says that in September and October 2011, he personally collected all outstanding payments from the residents who had taken loans for buying solar units. For two months, he visited Asarenagar on Sundays, collected money and created a register of payments. He says all dues of the 60 families were cleared till December 2011 and the register handed to the bank. From Kadappa’s house, we reach the main road, guided by a torchlight. by the help of torchlight. One of his curious neighbours asks us if we are the “solar people.” That is a question we have heard several times since we started coming to Asarenagar and I have learnt to recognise the half-hopeful half wistful emotion behind it. I wave my hand tiredly and mutter “newspaper” as I reach the main road. It is almost eight and in another hour the street will be deserted. As we ride out of the settlement, I automatically notice the lights leaking out of the open windows of the houses. The reddish glow of the kerosene lamp is easily distinguishable from bright solar light. Inside these houses, I imagine children like Yellamma, Lakshmy and Kaushalya squatting on the floor, their school books spread in front of them. I think of the effort people put in to educate their children, how important it is for them, and my thoughts meander over the kind of lives the children would lead when they grow up. Will they have jobs? Will their lives be different from the squalid drudgery of their parents’? Will they leave Asareangar behind? And I wonder if the decision will be made by a single light bulb burning far into the night. 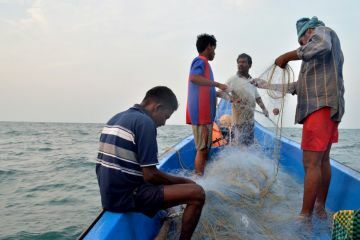 The fishing village of Kovalamkuppam near Chennai is battling two issues—the tsunami which robbed it of many of its boats, and the dwindling catch in the surrounding sea. 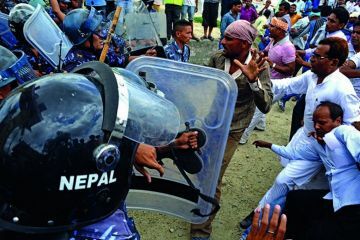 The Madhesi economic blockade has shut down life in Nepal. The government sees an Indian hand in this business as the impasse over the constitution continues.